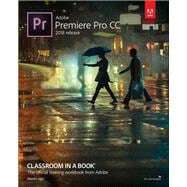 Maxim Jago is an Adobe Master Trainer, award-winning writer-director, consultant Futurist, and the author of several previous editions of this book and several editions of Adobe Premiere Pro Learn by Video. He speaks at film festivals and media technology events around the world, and has trained all types of editors–from schoolchildren to university professors, from ABC’s top editors in Australia to the BBC’s tech gurus in the UK. Visit his website at http://maximjago.com.